For several years, like many others, I had been after David Wells to write a book. I knew he had a book in him, and it was a great book. It’s just that he had to sit down and write it. David has been on the Catholic speakers’ circuit for a while. Catholics here in Canada, in the United States and in his native Britain have been delighted by his warm, offbeat humour through which he delivered thoughtful and penetrating lessons about Christian living. His stories, when strung together, offered a blueprint to conversion, a path to an ever-deeper commitment of our hearts to Jesus. The stories were the thing. They were about his children, his students when he was a teacher, parenting, working for the Church, even visiting the Rocky Mountains in Alberta. He could stand at a microphone and talk all day, one story after the other, and keep his audiences engaged and laughing. The trouble is that he had never tried writing a book and didn’t even know if he could. At long last, I can tell you that he can and has. 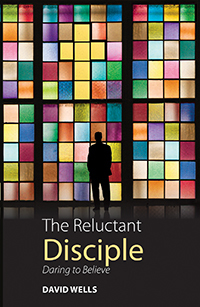 The book is called The Reluctant Disciple: Daring to Believe and has just been published in North America by Novalis. If you read only one spiritual book this year, choose this one. In his life, he has been a teacher, a father of three children, a travelling workshop presenter and the head of adult faith formation at Buckfast Abbey, UK. He has spoken at more than 300 religious education events around the globe, including many in Canada, where he is a favourite with Catholic educators. His first book will move you to explore your own faith. Each of his stories is tied to a scripture passage and includes questions for discussion or individual meditation. They range from a visit to a war cemetery in France, to climbing in the Rockies, classroom hijinks and an honest recounting of the first halting steps he made back to God that began with a visit to his local church. You will connect each story with something in your own life and be prodded into self-examination. David’s touch is gentle, but sure. His stories belong to all of us; they teach us a little bit more about who we are and our own weaving, uncertain path to love.